The head of the British School in Rome seems an unlikely person to commission the first modern house in England. 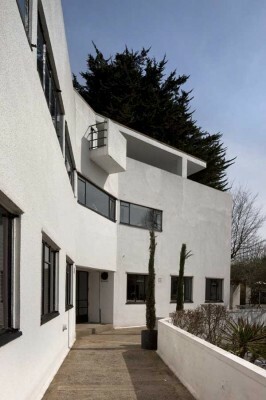 But it was the archaeologist, Professor Bernard Ashmole who, in 1928, asked one of his students, a young New Zealander called Amyas Connell to design his family home. It was Professor Ashmole’s appointment at University College, London, that led the Ashmoles to look for a rural site within easy commuting distance. They found 12 acres near Amersham, and the design evolved as a Y-shaped plan to optimise views and sun. There were no modern houses of quality in England at the time, but Connell had toured Europe and was aware of developments there. Concrete was the material that was regarded as ‘modern’ and the house was designed in concrete, but had to be redesigned as concrete frame with brick infill before local builders could face it. It was all rendered over to look like concrete. 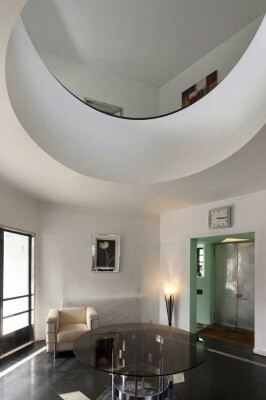 The building had glamour in the Hollywood sense, with magnificent spaces all opening up to a central hexagonal hallway; trim and entrance doors were stainless steel and internal doors were glass in silver painted steel frames. Chairs designed by Connell were a disappointment, but otherwise the interiors must have been sensational! All the qualities that modern architecture has lost! Connell planned a very formal garden for the estate, with numerous subsidiary buildings – squash court, water tower, lodge etc. 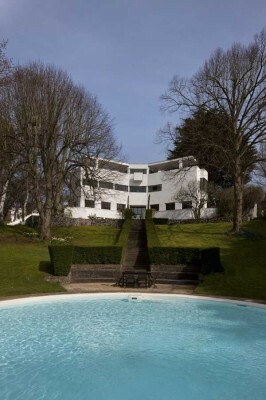 In 1933 the lower part of the site was sold and a series of small houses were built to the design of Basil Ward, Connell’s partner and brother-in –law. The Ashmole family loved the house, but sold it in the 1930s. 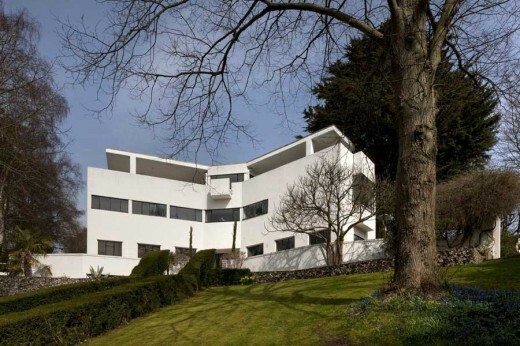 In the years after the second world war the house languished, the buildings of the pioneers of modern architecture in this country were out of fashion, and no one could afford to live on a grand scale. High and Over was threatened with demolition in the 1960s, but was saved by being subdivided into two dwellings. This implied the subdivision of the main spaces, and the glamorous features disappeared. The grounds were sold off and a housing estate built on the land. Someone, not appreciating the concrete frame, thought that the piers between ground floor windows were inadequate and enlarged them, as a result, sensitive photographers always avoid these windows. I remember visiting High and Over in the 1970s, and I found it a depressing experience. In the 1990s interest in modern architecture revived. High and Over was now old enough to be ‘Heritage’ and the House was listed. The two owners realized that they had an important building on their hands, and I was involved in restoration. This restoration could only be partial, as the two owners each guarded their half, so little could be done for the interior. The first priority seemed to be to remove the ugly textured coating that had been applied to the exterior, most of this came away quite easily, but some areas would not shift; in the end, reluctantly, we gave it another coat of textured paint, as the only thing that would stick. Next problem was the windows, the original windows were of ungalvanised steel, many had rusted and cracked the glass; we replaced the worst of them with new steel windows, galvanised, powder coated and double glazed, unfortunately the slightly heavier sections of current steel windows does lose some of the lightness of the old windows. The asphalt roof had reached the end of its life and was renewed, with insulation added. The roof and top floor was the Ashmole childrens’ domain, it was never subdivided and it is once again a delightful area for the younger generation. As I write, High and Over is on the market, so there is an opportunity for someone, with a deep pocket, to put the two halves together again and restore some of the glamour to the interior.